Scientifically speaking, it is family of plants which has existed for 60 to 100 million years. In the present day the family contains roughly 80 genera and 1500 species. They are found in almost every habitat and on almost every continent. Horticulturally speaking, it is any member of the genus named Iris which contains about 280 species. They can be bearded, beardless, or crested. Irises have been popular in gardens for centuries. Bearded irises, Siberian irises, Japanese irises, Pacific Coast irises, Spuria irises, and Louisiana irises are among the most popular. Mythologically speaking, Iris was a Greek goddess associated with communication and messages. She is personified by the rainbow. This must be why Linnaeus chose her name for this genus. Their flower colors span the full spectrum. Historically speaking, it is a plant that has been cultivated for thousands of years. In ancient Greece orris root was used in perfumery. This tradition has continued & spread over the centuries. 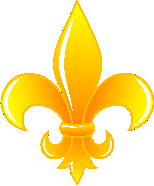 In the middle ages the fleur-de-lis symbol came into being and remains popular to this day. Practically speaking, it is a plant you should grow! Unless you're living in Antarctica chances are excellent that there are irises suitable for growing in your garden. Family Iris distribution map by MOBOT. Iris laevigata photo by R. D. Hager. Iris domestica photo by Dennis Kramb. Iris lusitanica photo by Sean Zera. Iris latifolia photo by Ken Walker. Iris sambucina photo by Lucia Cortopassi.